The Vegetable Seeds Market is segmented by vegetable type (Tomato, Cabbage, Sweet Pepper, Lettuce, Watermelon, Onion, Melon, Chinese Cabbage, Hot Pepper, Carrot, Sweet Corn, Eggplant, Okra, and Other Vegetable Types), and by geography. 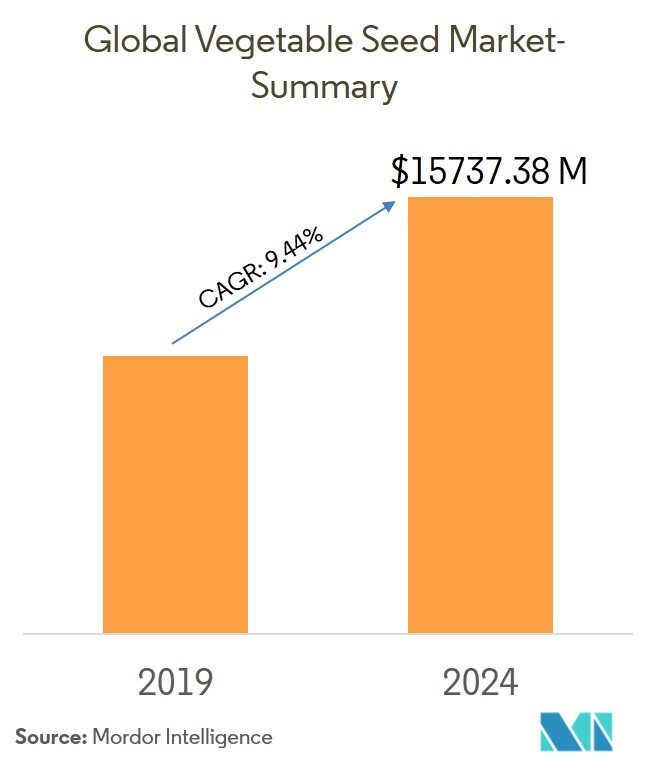 The vegetable seeds market was valued at USD 9,162.5 million in 2018 and is projected to register a CAGR of 9.44%, during the forecast period (2019-2024). North America is one of the largest markets for vegetable seed production and consumption, followed by Asia - Pacific and Europe. The European Union is the largest region, in terms of R&D expenditure on vegetable seeds. Vegetable seeds with high growth prospects include hot pepper, eggplant, Chinese cabbage, sweet pepper, and lettuce. The tomato, cabbage, sweet pepper, and lettuce segments account for shares of more than 30%. The tomato seed segment accounts for the largest share, followed by sweet pepper, lettuce, and cabbage. Vegetable seeds are defined as seeds that are used for commercial production of vegetables. The report considers all commercially cultivated vegetables throughout the world. However, the value of vegetable seeds planted with the sole purpose of seed production is eliminated from the estimation, to avoid double count errors. The report defines the vegetable seeds market as the set of buyers who procure seeds from an organized seed market, for the commercial production of vegetables. The buyers include farmers and institutional buyers operating in vegetable and/or vegetable-based production. The farmers who cultivate vegetable crops using saved seeds, or seeds produced from the previous production, are not a part of the studied market. The Indian domestic vegetable seeds industry is expected to double, to around USD 1,179 million, over the next five years. 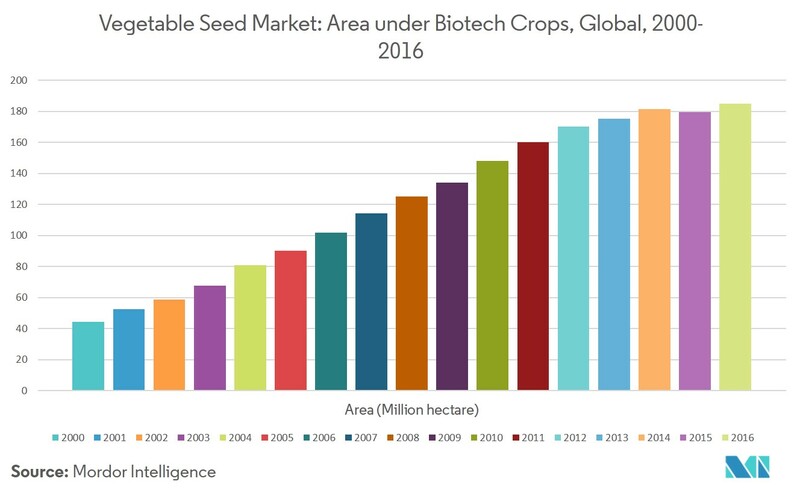 According to ICRA, this growth is supposed to be driven by increased use of hybrid seeds. The number of hectares under biotech crop production increased from 179.7 million in 2015, to about 185.1 million in 2016. Developing countries accounted for around 54% of the global biotech hectares, compared to 46% of the industrial countries. The increasing awareness regarding the consumption of vegetables, to meet diverse dietary and nutritional needs, has caused a rise in the demand for vegetables. Among all the vegetable seeds, cabbage (100%) and tomato (99.3%) account for the highest seed replacement rate. Currently, only 20% of seeds used by the farmers are of good quality, whereas, the remaining 75% of demand is being catered to by the saved seeds of farmers, from the previous season. 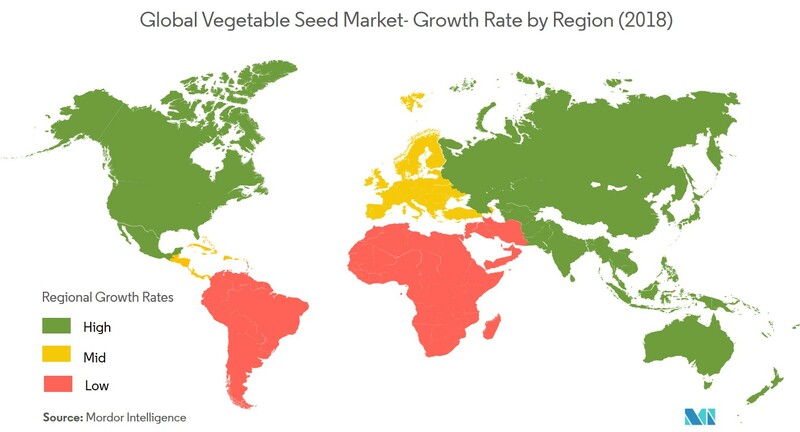 North America is the largest market for vegetable seeds production and consumption in the world as of 2018. 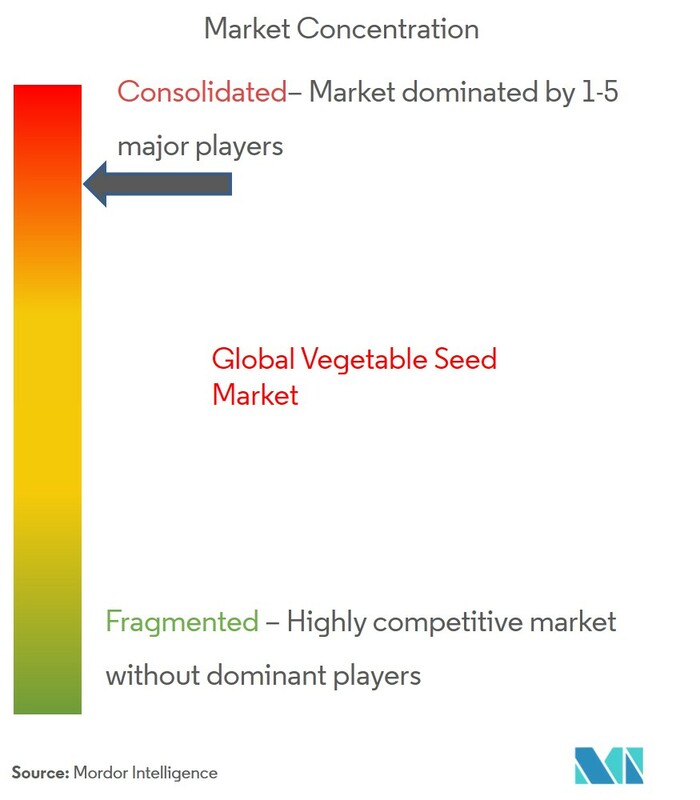 The North American vegetable seeds market is highly concentrated, with around 85% of market share being occupied by the top ten players in this region. Monsanto, Limagrain, Syngenta, and Bayer CropScience are the most influential seed companies in this market. The United States is the largest vegetable seeds market in the North American region. Vegetable growers in the United States are mostly small land holding individual farmers, who grow vegetables in less than 15 acres of land. Around 33% of vegetable growers are small farmers and only 9% of farmers have large vegetable fields and can sell vegetables worth USD 500,000 per year. In the vegetable seeds market, companies are not only competing on product quality and product promotion but also on strategic moves to acquire greater market share. More than 25% of the major strategic moves, performed by key players, involves a new product launch or product development. Over the past five years, Monsanto Company has been the most active player, in terms of strategic development, in the vegetable seeds business. Its major strategic developments made it reflect the core strategy of the Monsanto Group. Monsanto has been focusing on R&D, either by means of R&D facility expansion or through collaboration with other institutions working in R&D of vegetable seeds.